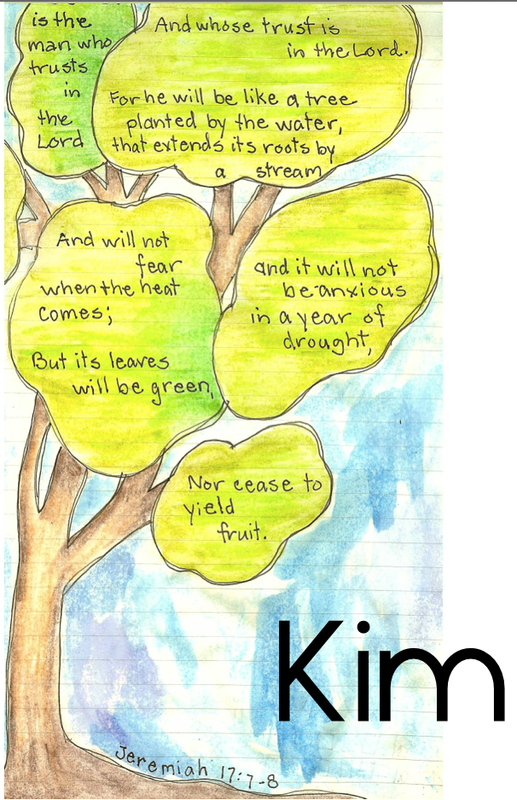 This scripture was part of this morning’s message at church. And what perfect timing! I think we all have giving thanks on the mind during the month of November, especially the week of Thanksgiving celebrations. But, how important is it to give thanks to God always? I journaled this in my bible during the service so I would not forget. It is finished with watercolor pencils and my water pen. This is a great story. Read it a couple times and make note of what you learn. Feel free to trace my drawing for your own, or use the idea to draw your own. This is what I learned from these verses in Luke. Please share your insights! 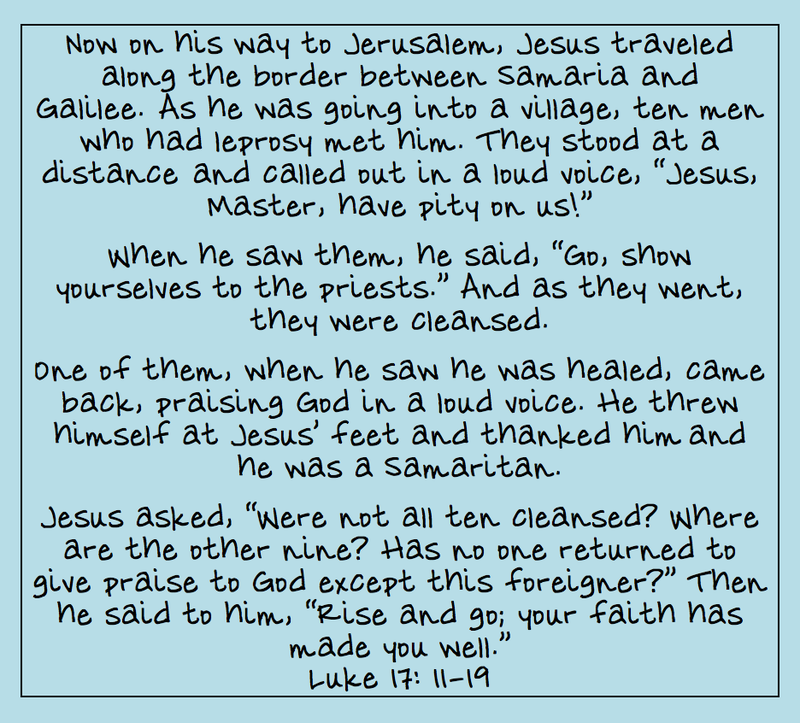 The ten men in the village had no reservations about asking Jesus for help. They even had to yell from a distance to accomplish that, because they were not allowed to be near other people. Jesus sent them to the priests. Normally, He spoke words over a sick person, or touched him. But in this instance, He was asking for the lepers to go to the priests, requiring some faith on their parts. Only one of the ten returned to Jesus to thank Him for healing him of leprosy. This one was a Samaritan, who would not normally dare to go see the Jewish priests. He believed Jesus would heal him in whatever way He chose. Jesus noticed the rest had not returned to thank Him. He did not demand thanks, but He noticed when it was not given. His own chosen people, who knew the prophesy that told them He was the Son of God who had come to save them, did not understand what had really happened. Jesus wanted the Samaritan who gave Him the glory, to know that he was not only healed in body, but in his soul, because he believed. It makes me think about how many times I ask Him for things. And how many times I forget to thank Him for answering my prayers. I am His chosen child, I have faith that He will answer my prayers, but I never want to forget or take for granted the biggest gift He has given me. His grace has saved my soul. He notices when I am not thankful. 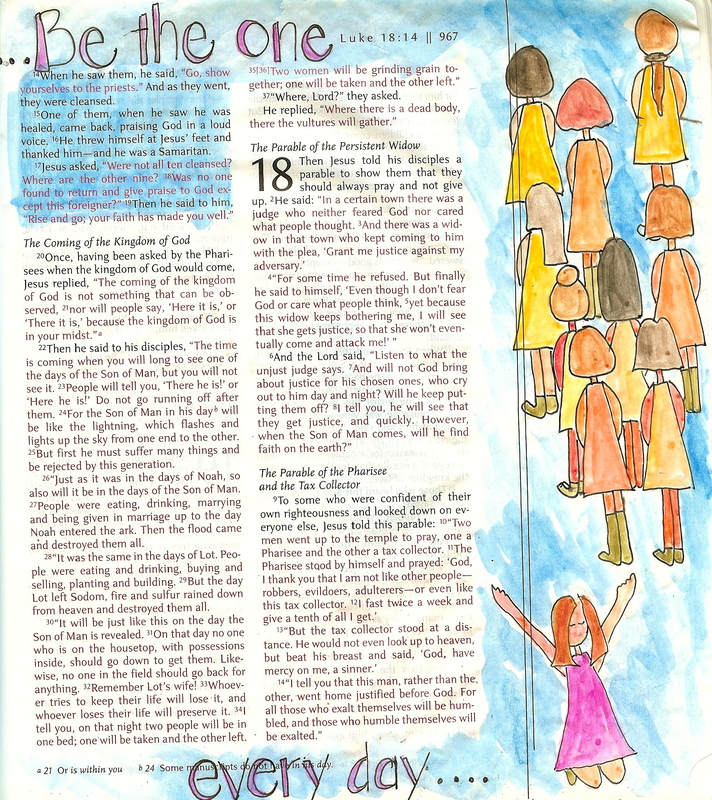 This entry was posted in Learning from the Word, The Word and Some Art and tagged Be the One, bible journaling, luke 17, thanks, watercolor pencils. Bookmark the permalink.